What Is The Hardest Insanity Asylum Workout? This is a trick question. All of the Insanity Asylum workouts are hard. If you haven’t started Asylum yet and are looking toward an off day then this isn’t the workout for you. Anyways, the list below is from my experience of doing Insanity Asylum. Gameday – At 60 minutes it’s the longest Asylum workout. You only do it 3 times in the program as it’s designed to incorporate a lot of the moves from the other workouts. Its miserable. Speed & Agility – I feel this workout is the basis of the entire program. Every move you do is meant to be fast. Pushups, rope jumping, squats while jump roping, and shoulder taps going through the agility ladder. Strength – My Bowflex Dumbbells were getting a workout of their own during the first ten minutes. Shaun T does so many combo moves with them that you’re hurting everywhere. If you’re in good enough shape you’ll be able to use the pull up bar for some of the moves. I was dead tired by then and could barely do 1 so I stuck with the weights. Vertical Plyo – Jump rope, jump, push ups in the agility ladder, more jump roping, more moving push ups, and more jumping. 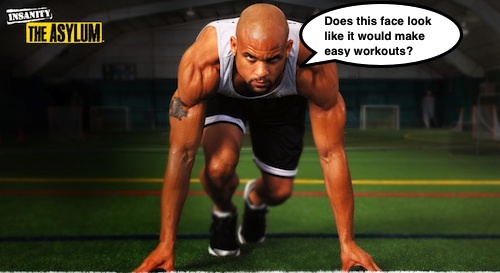 Fit Test – While its designed to asses where you’re at physically, the fit test is no joke. The 9 moves are tough with very little time in between to catch your breath. Back To Core – The warmup gets the heart pumping which leads into a tough lunge with pulse sequence. This workout is more about using your core to maintain stability in the moves. Overtime – Its probably not fair to put this 15 minute workout so low as you only do it twice in Asylum and its after the grueling Game Day workout. On its own this would be an ideal total body workout to be done when you’re short on time. Relief – Here comes your easy day. This workout is only 25 minutes long and you stretch for the majority of it. Pretty much what the title says. My list might be a little different than yours and that’s cool. In order, these were the Asylum workouts that were hardest for me. It was a toss up for Strength and Vertical Plyo as I have a knee injury which limited me in how hard I could push myself with all the jumping. In the end all of the Insanity Asylum workouts are hard and there really are no off days.